ProTECTOR Inc. is an organization with the goal of expanding our understanding of sea turtle biology and ecology through research, in the country of Honduras. The organization was formed because we recognized that there is great need for research on sea turtles in the region and that research, linked with educational outreach and community involvement, can strongly influence management decisions about these valuable marine residents. To do this, ProTECTOR Inc.oversees the establishment, continuance and completion of numerous sea turtle research and outreach projects in Honduras, with the aim of facilitating better decision-making for marine area management, as well as awareness of sea turtles on the part of both local residents and the visiting public. Projects include the Turtle Awareness and Protection Studies (TAPS), which is tracking juvenile turtles along the coast of Roatan. TAPS also provides opportunities for public support of this research through the Turtle Adoption Program. Other projects include satellite tracking (SatTrack), the development of a national Nesting Beach Monitoring Network (NBMN), Health Monitoring of Captive Sea Turtles (HeMoCaST) and a series of Honduras Sea Turtle Active Research workshops (HSTAR). To ensure the conservation, protection and management of all sea turtle species found in the waters of Central and North America, with special emphasis on Honduras, through educational outreach, ongoing training, and scientific research. We envision the waters of Honduras as places where sea turtles and all marine life are valued as essential, integrated units of biodiversity, protected by national and international communities and enjoyed by residents and visitors. Click here to read more about the ProTECTOR board members. "In my thirty plus years of diving, I had never encountered a tagged creature of any kind and must admit that I wasn't quite sure whether reporting my sightings to you was of any consequence. I am certainly glad to see that they are deemed valuable and, as a fellow Canadian, proud they can contribute to your work. The pleasure and awe I felt seeing that the turtles were tagged were indescribable as many first-time experiences tend to be underwater. However, I was a little dismayed at the lack of enthusiasm of the locals with regards to reporting the sightings. This prompted me to write a letter to Diver Magazine suggesting they do a feature on this. I hope that this doesn't cause you any undue inconvenience. I haven't received a reply as of yet, but hope they can inform the diving community and perhaps, in the process, give you some exposure. The importance of your work, not only for the turtles, but diving community as a whole, goes without saying." For more information on our ProTECTOR Inc. work out of the Roatan Dive Center, see the ProTECTOR Inc. Facebook page here. 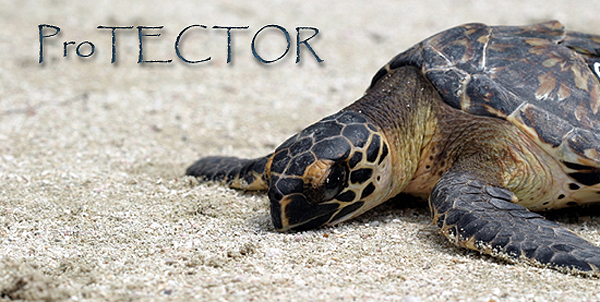 ProTECTOR Inc. is a proud member of the Wider Caribbean Sea Turtle Conservation Network (WIDECAST), whose support of the research and conservation efforts of ProTECTOR Inc. in Honduras have done much to facilitate our success. Find out more about WIDECAST here and about WIDECAST Honduras here.